Root-Whisper Village is an abandoned village located in Murkmire. It was previously the home of the Root-Whisper Tribe which was destroyed during an incursion of Barsaebic Ayleids from the north. However, the tribe protected their souls from being taken by placing them in the Remnant of Argon—at the cost of their Hist's health, leading it to go to sleep. 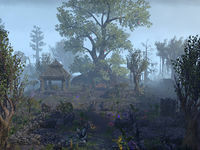 The village and it's Hist became just another story from Murkmire. After the events of By River and Root, the Hist is reawakened and the village becomes the home of the reborn Root-Whisper tribe. This new tribe is made up of both members from the Bright-Throat and Dead-Water tribes, as well as others—including lukiuls who have been drawn to the village. As the both the tribe and village are being re-established, they are always looking for assistance. It is nestled between the twin temples, Xul-Thuxis and Vakka-Bok, suggesting that in pre-Duskfall times it was an important place. The Remnant of Argon: Pass through an Ayleid realm of portals to locate the lost Remnant. Swamp Jelly Sonata: Collect a variety of swamp jellies for an aspiring Argonian musician. Aloe That Heals: Collect some aloe plants for the Root-Whisper tribe healers. Envoys Who Cower: Search for the missing Root-Whisper envoys in Blackguard Caravan. Leather That Protects: Gather some hackwing hides for the Root-Whisper warriors and hunters. Mushrooms That Nourish: Collect some mushrooms from Blight Bog Sump. Offerings That Hide: Retrieve some stolen offerings for the Root-Whisper tribe. Root-Whisper Wayshrine can be found inside the village. The village can be seen in its less ruined state in the Mists, during a dream-wallow. This page was last modified on 13 March 2019, at 17:01.